The Walking Dead: Long Road Ahead features two new survivors for Lee to worry about. Last week Telltale Games was kind enough to confirm an iOS release date for Episode 2 of its point-and-click The Walking Dead series. Now it's saying that Long Road Ahead is due any day, and could be out as early as September. 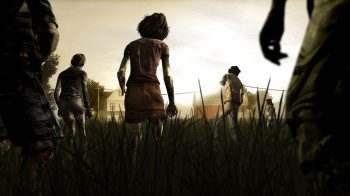 Two new survivors will be introduced in this episode, and events post-farm will be explored. "Episode Three: Long Road Ahead is in submission with our first party partners and we are anxiously awaiting a release date to be confirmed," said Telltale. "We anticipate that this could be as soon as next week, and as soon as we have a confirmation on all platforms, we'll be letting everyone know as soon as it happens." Presumably confirmation on all platforms means iOS too, which will make a pleasant change from last time. UPDATE: Episode 3 will release August 28th for PlayStation, August 29th for Xbox and PC/Mac.